Over the last year, Leeds has been blessed with the opening of several new refill stores. 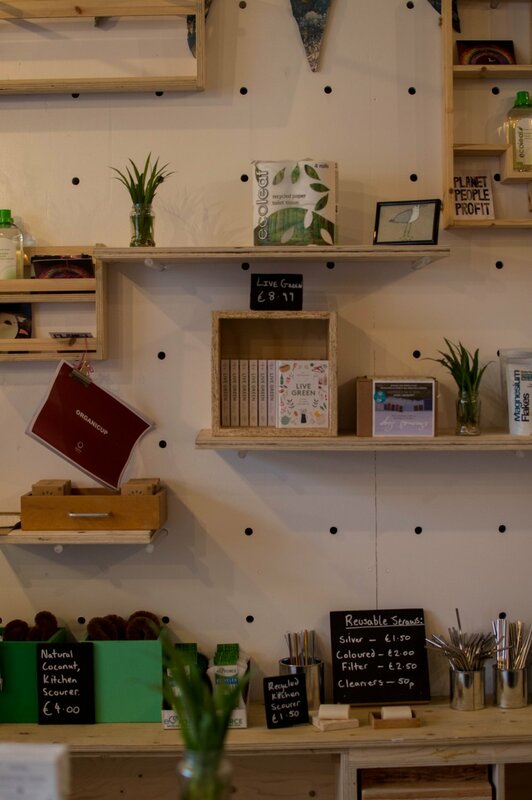 The wonderful Jar Tree in Leeds market sells dried goods like basmati rice, nuts, spices and loose lasagne sheets as well as household goods and personal care items (you can check out the full stock list here). 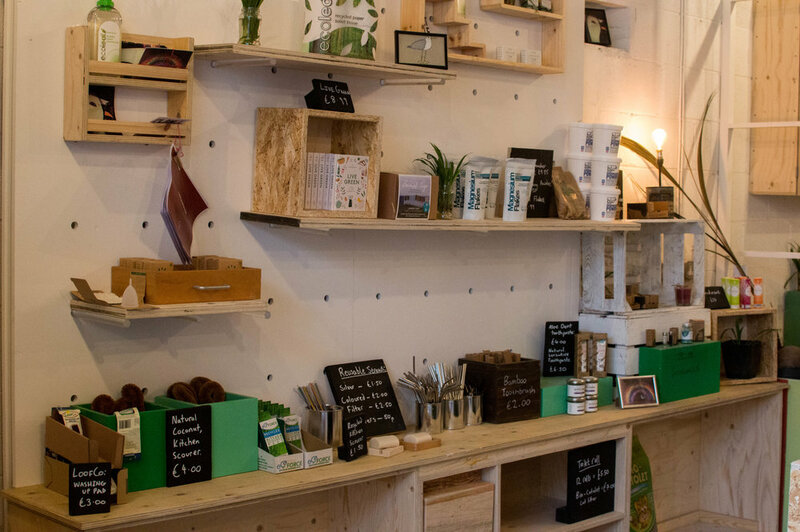 Also in Leeds city centre is Ecotopia based in the County Arcade and they sell dried goods, household products and offer a great range of zero waste recipe kits. In Chapel Allerton, you can find the newly opened The Refilling Station on Harrogate Road who sell loose pantry ingredients, natural beauty products and household supplies. And in Kirkstall, you can now find a refill section at the back of Seagulls Reuse paint store. Run by environmentalists and social entrepreneurs, Cat and Kate (you can find out more about them here), Seagulls is a community project which offers volunteering opportunities for marginalised and hard to reach people. If you are a resident here in the city, you may have seen their distinctive pink units at recycling centres, where you can drop off your unused emulsion or gloss paint. Every year they collect and reuse over 170 tonnes of paint which they reprocess and turn into new tins of paint. It’s a brilliant idea and if you are looking to redecorate on a budget with sustainability in mind, then it’s the perfect way to go. White emulsion costs as little as £1 per litre! And they will happily colour match other paint brands like Farrow and Ball for as little as £8.00 for two and a half litres. They have recently turned the rear of the premises into a refill store, offering customers eco products at reasonable prices that also help to support the great work that they do in the community. I’ve been regularly popping in to the refills section to stock up on laundry liquid and a few other bits and pieces. I usually take along a couple of old Ecover bottles to refill but you can buy glass bottles and storage jars there as well as amber glass bottles with trigger sprays or pump dispensers. If you are taking your own container, then you don’t even need to worry about it being empty as it’s weighed prior to refill. 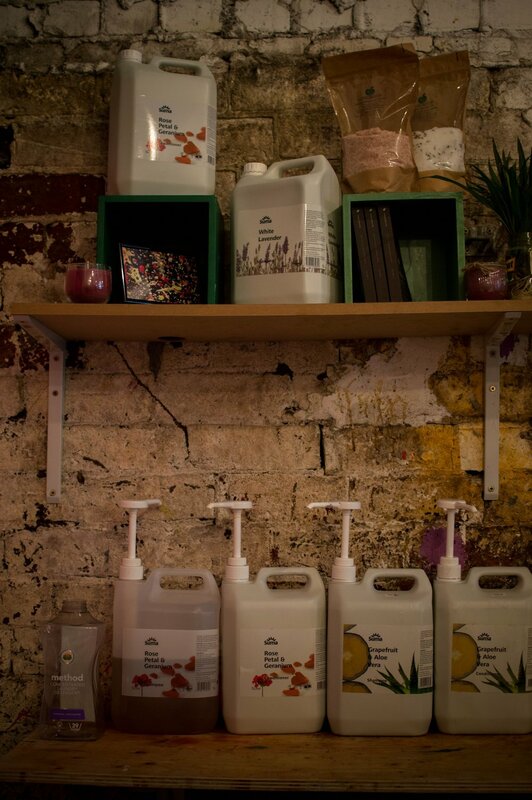 For household refills there are Ecoleaf laundry liquid, fabric conditioner and washing up liquid as well as BioD toilet cleaner and floor cleaner. There is also a great selection of refillable shampoo, conditioner and body wash products from Suma and Faith in Nature. In the household section you will find loofah washing up pads, coconut scourers and refillable bicarbonate of soda to use in your own natural cleaning recipes (they are aiming to get liquid castile soap for refills in the very near future). There is also recyclable toilet roll, eco cat litter, BioD laundry powder and dishwashing powder. For personal care, there are menstrual cups, shaving soaps, natural deodorants, refillable make up remover, reusable, washable make up remover pads and Faith in Nature soap bars. 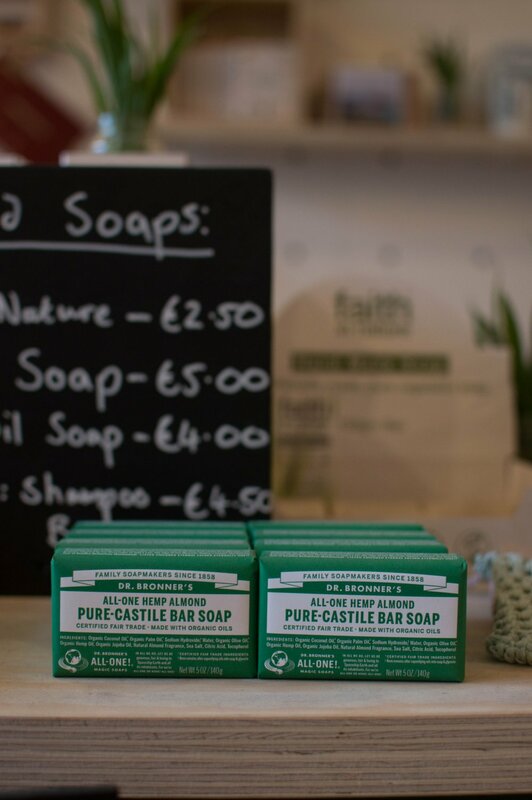 You will also find bars of Dr Bronner’s Castile soap and locally made, reusable soap bags which I think are a must if you are going to switch to bar soap in the shower. For dental care, there are bamboo toothbrushes, Georganics toothpaste and natural dental floss in refillable glass bottles. 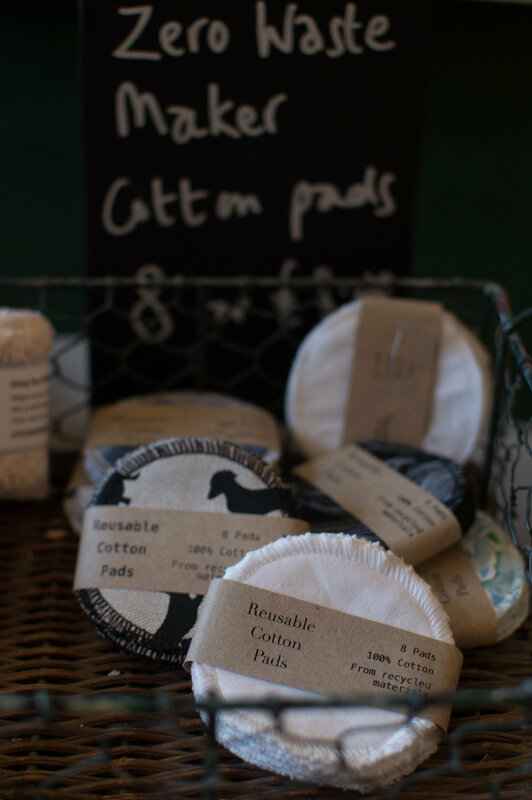 Along with all the day to day goods, there are cotton string shopping bags, locally made scented soy candles, unscented soy tealights, aromatherapy oils, carrier oils and vegan wax wraps. And I must mention that they sell Live Green here too! So it gives me great pleasure to announce that I’m doing a talk on how to ‘live green and live simply’ at Seagulls on Thursday 25 April 2019 at 7pm. I’ll also be happy to sign copies of my book, Live Green and have a chat with everyone over some wine and nibbles! If you would like to join me, then tickets are limited and available through Eventbrite here. There is a charge for tickets but all the money is going back to Seagulls as I’m supporting the fantastic work that they do here in Leeds. I do hope to see some of you there! And even if you can’t make this event, do please pop along and stock up in their refill shop as every penny they earn helps them continue with this amazing enterprise.